TETRON PTFE & FEP Tubing offers an unmatched balance of properties making it useful for a variety of harsh service uses. Why two types of tubing? Chemical: Lite PTFE, FEP tubing is chemically inert to essentially all industrial chemicals and solvents, even at elevated temperatures and pressures. However, it reacts with fluorine, molten alkali metals and molten sodium hydroxide. FEP absorbs practically no common acids or bases at temperatures of 200°C, for 12 months exposure. Zero Moisture Absorption: No swelling or change in properties due to moisture absorption. Indefinite Shelf Life: The outstanding aging resistance of PTFE and FEP prevents embrittlement with age. Low Friction: The inherent slipperiness of PTFE& FEP make assembly quick and easy. Non-Flammability: Does not smoke or support combustion. Harnessing: Hold several cables together in high temperature environment, insulating cable sheave. Slip on Insulation: The flexibility and slipperiness of Tetron PTFE and FEP tubing permits it to be readily slipped on primary conductors or fuses as insulators. Corrosives - Almost universally inert. Sticky Materials - Paint, adhesives, chocolate, molasses, etc, without clogging. Paint Spray Equipment - Clean up easily by circulating chemical cleaner or steam clean when changing colours. Sample Collection Equipment - Eliminates contamination. 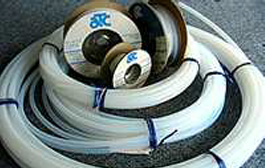 Medical Tubing - Cap be easily sterilized either by heat or chemicals.